After trolling US president Donald Trump, Burger King is back to ignite a fast food war against McDonald’s. 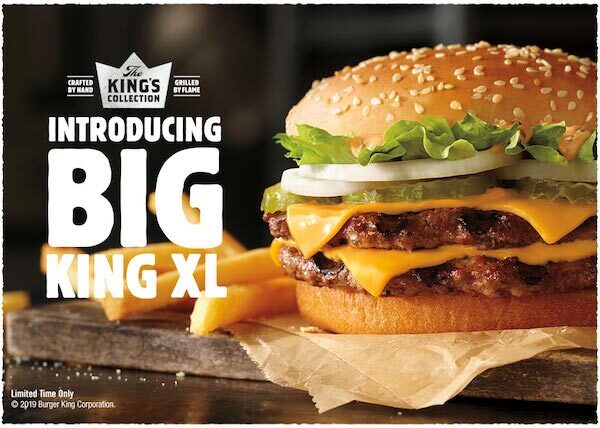 To challenge the 50-year legacy of McDonald’s ‘Big Mac’, the chain has unleashed a “bigger” answer to the sandwich: the ‘Big King XL’, which will be free-of-charge through a couple of channels until the end of January. Burger King’s ‘Big King XL’ arrives with 100-percent beef patties measuring half-a-pound each, American cheese, sliced onions, pickles, letters, and a special ‘Stacker’ sauce in a toasted sesame bun. It’s a dead ringer for the ‘Big Mac’—even the name suggests so—but it’s in no way a coincidence. The new sandwich is Burger King’s submission that it can do better than the 50-year-old ‘Big Mac’. In place of a third bun in the middle is an extra patty; the burger is thus stacked with “175-percent more flame-grilled beef than the ‘Big Mac’,” the restaurant claims. “The ‘Big King XL’ sandwich will make guests want to swap their bread for beef—literally,” the chain said in a press statement. You might also recall that McDonald’s handed out ‘MacCoins’ last year to celebrate the 50th birthday of the ‘Big Mac’; these were redeemable for free sandwiches. If you’re willing to let yours go, Burger King will exchange your expired tokens with free ‘Big King XL’ burgers in Chicago—the home of McDonald’s. If you haven’t got your hands on the rare ‘MacCoin’ or don’t live in Chicago, fret not—there’s a far easier way to score a free burger from the King. Until the end of January 2019, all US customers can receive a complementary ‘Big King XL’ if they spend a minimum of US$3 in an order via the Grubhub app or website. Grubhub is waiving delivery charges for all Burger King orders during this promotional period, so you won’t have to top up any cash to get a free sandwich that’s larger than a ‘Whopper’. Time to hit up Burger King to fix your ‘Big Mac’ cravings, perhaps?